Elliptical galaxies, such as that depicted in this artwork, are vast assemblages of stars which resemble gigantic rugby balls. Because they are ellipsoidal, three-dimensional, not disc-shaped like spirals, they tend to contain far more stars than spirals of similar diameter. 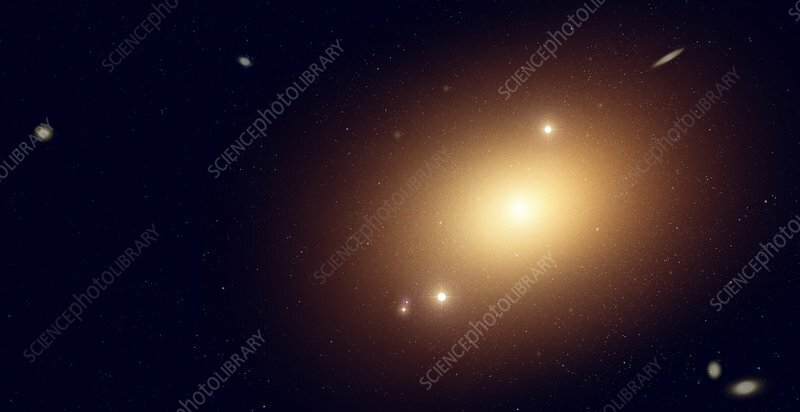 Elliptical galaxies have few sites of active star formation, and are composed almost entirely of old stars. They are among the most massive galaxies in existence, some of them harbouring stars in their trillions. The smaller galaxies in this illustration are dwarf galaxies in orbit around the main one.